HISENSE’S 55A6200 ISN’T much of a looker. It’s plasticky black screen frame and chunky rear make it look like a throw back to 2007. At least its feet are more elegant than most. Its remote is much more friendly than the Cello’s, though. It’s spaciously and logically laid out, and provides direct buttons for Netflix, Amazon Prime, YouTube and Rakuten. It also carries the Freeview Play app to bring together catchup of the UK’s main terrestrial broadcasters. Netflix, Amazon Prime and YouTube are available in 4K and HDR. The smart interface looks dated, and a fair number of its apps are of little interest. But getting even a half-decent smart hub on a 55in 4K TV is arguably a bonus. The set supports HDR10 via its three HDMI inputs, and carries both gamma and colour calibration tools. Its HDR10 talents are to some extent ‘name only’, on account of the screen being capable of delivering only around 218 nits of brightness on a 10 per cent white HDR window. This is barely beyond SDR brightness territory, really. And the colour range the set can deliver struggles to best REC.709 values, which can leave the 55A6200’s hues looking a touch under-saturated with HDR content. This doesn’t mean, though, that the 55A6200 gives a poor account of itself with our The Predator 4K Blu-ray. There’s neither the banding nor the glowing colour blocks in bright HDR scenes seen on the Cello set, and aside from some occasionally slightly jaundiced skin tones, the 4K BD’s colours look more natural and balanced, if a bit pallid. Black levels, too, are noticeably deeper, and the screen is less affected by distracting backlight clouding, due, most likely, to its use of a direct rather than edge-lit panel. 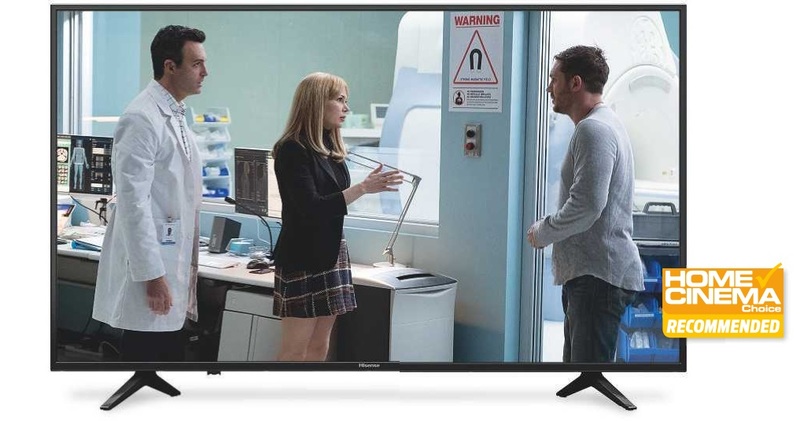 While the 55A6200 maps The Predator 4K Blu-ray’s aggressive HDR transfer to its screen’s capabilities quite cleverly, I will stress again that the result doesn’t really look like HDR – but at least it doesn’t look horrible with such content, which is more than can be said for many similarly cheap LCD TVs. And it does also feel like genuine 4K: clean, sharp and detailed. The final extended scrap with the super Predator generates pleasingly little motion blur. The 55A6200 performs excellently for its money, with the SDR Blu-ray version of The Predator. The combination of sharpness, colour richness/finesse and contrast is excellent for such an affordable set. reduction systems are also best avoided if you’re watching native 4K. Finally, the set loses subtle detail and tones in bright areas. Bright skies above the weapons market in The Predator look almost entirely white in HDR on the 55A6200, rather than nuanced and shaded. I’ll wrap up, though, on a couple of positives. A very respectable 24ms input lag is sure to boost its appeal to gamers, and its audio performance is surprisingly solid for the money. It can become a touch shrill during The Predator’s densest soundtrack moments, but it’s strong with dialogue and detail, and has enough power to expand at least a bit to accommodate the film’s loudest excesses.